I read an collection of Grist's earliest stories with this character quite a while ago, and thought I'd take another stab at the character with this collection of his first colour stories. I really want to like this book. I like Grist's art a lot; his style reminds me of a mix of Tim Sale and Ryan Ottley (from Invincible), and I enjoy his very clean approach to superheroics. 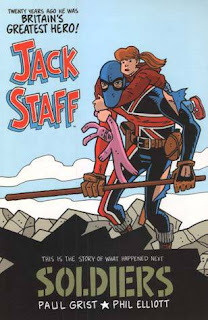 Also, I adore the design of Jack Staff, which is very reminiscent of Marvel's Union Jack. My problem lies with the plotting of this comic. Grist often seems to be writing this in four or five page installments (was this material originally used in a British comics magazine? ), and I find that the story is very hard to follow because of this. The plot of Soldiers is about revealing the reason why Jack gave up the Staff some twenty years prior, as he deals with a threat in the modern day. The time jumps are so sudden it's hard to know which part of the story I'm reading at any given time, especially since there are frequently large sections of story given over to supporting characters. There is a lot of potential in a character and book like this, and I know it has a large group of devoted followers, but I found this really didn't work for me.